The Haltom City Fire/Rescue Department is comprised of four divisions. Containing the office of the Fire Chief, the division of Fire Administration directs the administrative and operational activities of Fire/Rescue, encompassing the coordination of agreements, budgeting, policy and program development, data collection and analysis, resource management and public information. Appointed Fire Chief in January, 2019, Fire Chief Brian Jacobs has been with the Haltom City Fire Department since 1999. Working his way through the ranks, he has served on all three shifts of the department. Chief Jacobs was born and raised in Haltom City, graduating from Haltom High School. 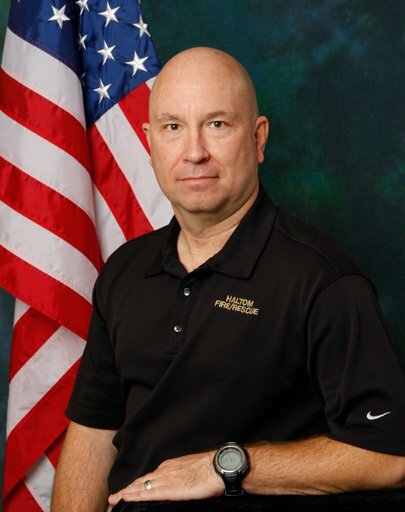 He continued his education with Tarrant County and Weatherford Colleges, earning several Texas Commission on Fire Protection Certifications and a degree in Fire Administration. Deputy Chief Dr. Fred Napp was appointed Deputy Fire Chief in March, 2019. Deputy Chief Napp started his career in the fire service as a volunteer firefighter/EMT in 1983. 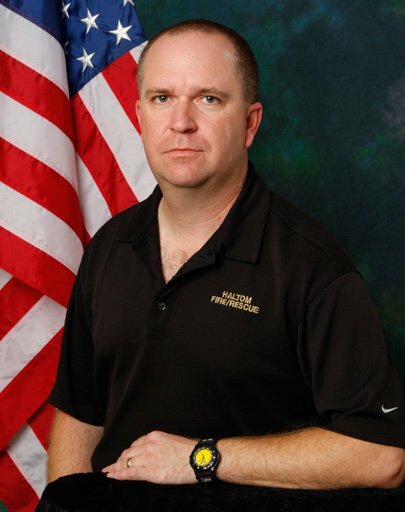 After starting a career as a teacher 1987, he began his career in Haltom City as a firefighter in 1993. Since that time he was promoted to Lieutenant, Deputy Chief of Services and then in 2007 he was appointed Fire Marshal. He holds five degrees, including a Ph.D. in Leadership Studies. He is currently in the final year of the National Fire Academy’s Executive Officer Program, which is held in Emmitsburg, Maryland. Dr. Napp is married to Heather who is an elementary school teacher. Battalion Chief Damian Vogle was appointed to that position in the summer of 2017. The Division of Emergency Management is responsible for the warning system that notifies residents of impending dangerous situations that may endanger city residents and property. Fire Services is supported by the Fire Operations Division, which conducts commercial inspections, multi-family inspections and public education programs. Fire Services performs new occupancy and follow-up inspections that focus on code compliance and enforcement. Fire Services conducts plan reviews for site development, building construction and fire-safety/suppression equipment within facilities. Fire Services coordinates all fire and arson investigations as well as activities and training with police and fire dispatch, R.A.C.E.S. volunteers and the Juvenile Firesetter Program. Each element of Fire Services is interrelated and focused being on prevention of injury and loss of life or property of Haltom City citizens and visitors. Headed by the Deputy Chief, the Fire Suppression Division is responsible for providing emergency responses for fire, rescue, emergency medical services, hazardous material containment and explosives. Additional activities include training personnel to meet state standards and provide high proficiency. The division performs annual multi-family housing and commercial building inspections to eliminate fire hazards. It also provides fire prevention education programs to Haltom City schools and daycare centers and performs hydrant testing, pre-fire planning and fire investigations and maintains apparatus, equipment and stations.